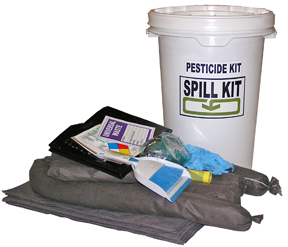 If you use, transport or store pesticides or herbicides, this Spill Kit is a must have. Be prepared for a spill if you use, transport or store pesticides or herbicides. This Spill Kit provides materials to help comply with regulations for hazardous pesticide spills as required by Dept of Agriculture, DOT, EPA and Board of Health. The container is a UN rated 5 gallon pail. The gasket sealed screw On/Off lid is water tight. A refill kit is available.